The Kronprinzessin Cecilie was the last of the German Four Flyers. 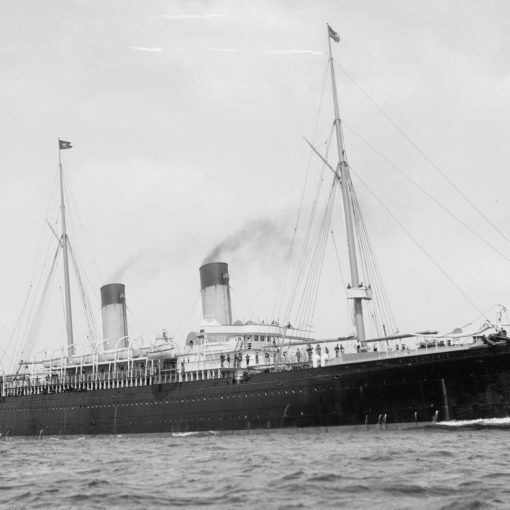 The last German four stacker - the luxurious Kronprinzessin Cecilie. The spacious and opulent restaurant in first class. The interiors of the Kronprinzessin Cecilie was among the most luxurious at the time. The Kronprinzessin Cecilie with black funnel tops, in an attempt to masquerade as the White Star liner Olympic. As the USS Mount Vernon, the former German speed champion was put to military use in World War I. 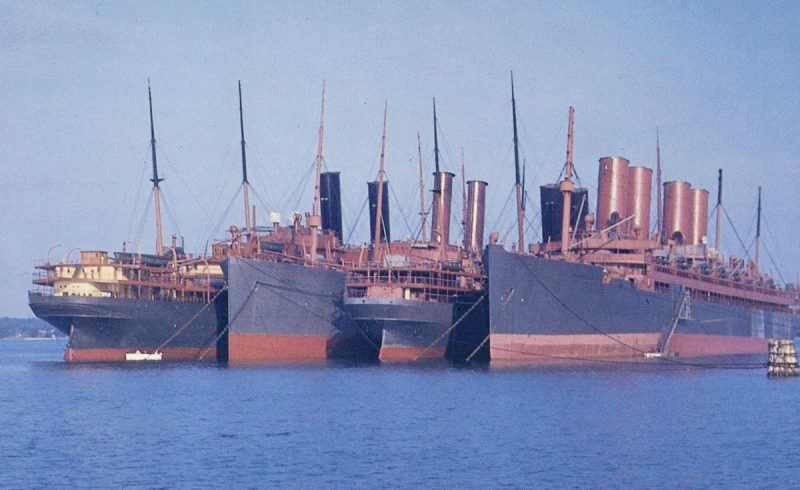 For 21 years, the Kronprinzessin Cecilie (second from the right) and her sister Kaiser Wilhelm II (far right) lay rusting together in the American port of Chesapeake Bay. The British engineer Isambard Kingdom Brunel had started the era of the true ocean liner in 1860 when his magnificent 19,000-tonner Great Eastern entered the waves as the largest man-made object ever built. In fact, the ship was six times larger than any previous vessel. It took about forty years before any liner caught up with the Great Eastern. The way towards this goal contained many distinguished ships. The White Star Line’s 9,000-tonners Teutonic and Majestic were launched in the 1880s, and the Cunard Line’s Campania and Lucania in the 1890s. All four of these liners held the Blue Riband of the Atlantic for some time. But these ships would be remembered for their speed – not their size. The ship that finally took the honour of being the largest vessel ever constructed was the White Star liner Celtic in 1901. This ship was the largest in the world, but certainly not the fastest. Speed had been left for the new German liners that emerged in the late 1890s, beginning with the Kaiser Wilhelm der Grosse in 1897. 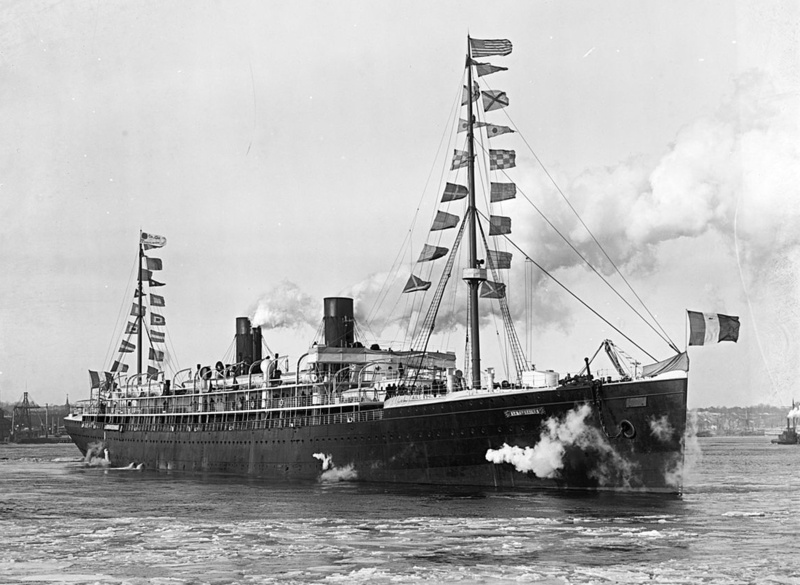 The Kaiser Wilhelm der Grosse was run by the Bremen-based shipping line Norddeutscher Lloyd. 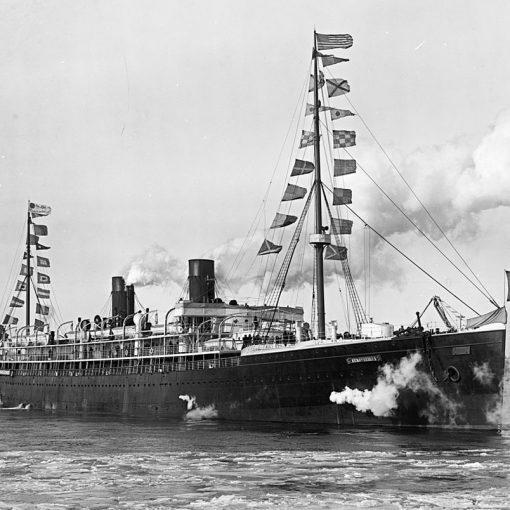 The Norddeutscher Lloyd did not only have the British to compete with; at Hamburg, another German shipping line was based – the Hamburg-Amerika Linie. The latter company took the Blue Riband from the Kaiser Wilhelm der Grosse in 1900, and would keep it for almost the next full six years. 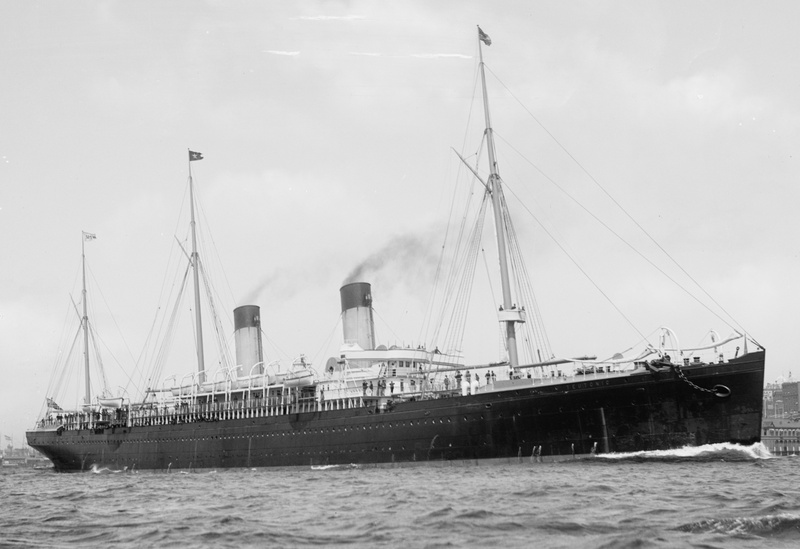 However, the Norddeutscher Lloyd took back the prize for a year on the westbound run with the new Kronprinz Wilhelm. This ship was the second of the Kaiser Wilhelm der Grosse-class. The third came in 1903 and was named Kaiser Wilhelm II to honour the present German Kaiser. The Kaiser Wilhelm II was the first German ship to exceed the size of the Great Eastern. Norddeutscher Lloyd was not entirely satisfied, though. They had lost the Blue Riband to Hamburg-Amerika and wanted to compensate this somehow. Finally, it was decided to expand the existing ‘Kaiser-trio’ into a quartet. The Kaiser Wilhelm II was to have a sister. The builders of the fourth sister were the Vulcan Shipyards in Stettin, Northern Germany. In July 1907, the dashing new Kronprinzessin Cecilie was planned to leave Bremerhaven on her maiden voyage. However, that would not be the case. Before the maiden voyage could take place, the ship sank in Bremerhaven harbour. Not until the next month on the 6th, had the ship been pumped out and repaired, and could finally set out on her maiden voyage. The Kronprinzessin Cecilie was a virtual copy of the Kaiser Wilhelm II, having almost the same figure of tonnage. At last had the Germans an awaited four-ship express run over the Atlantic, and the Kronprinzessin Cecilie along with her sisters became very popular. Each of the ships had a service speed of between 22 and 23 knots, a very high figure when considering that the rate for achieving the Blue Riband was just above 23 knots. But the speed was not all that attracted passengers. 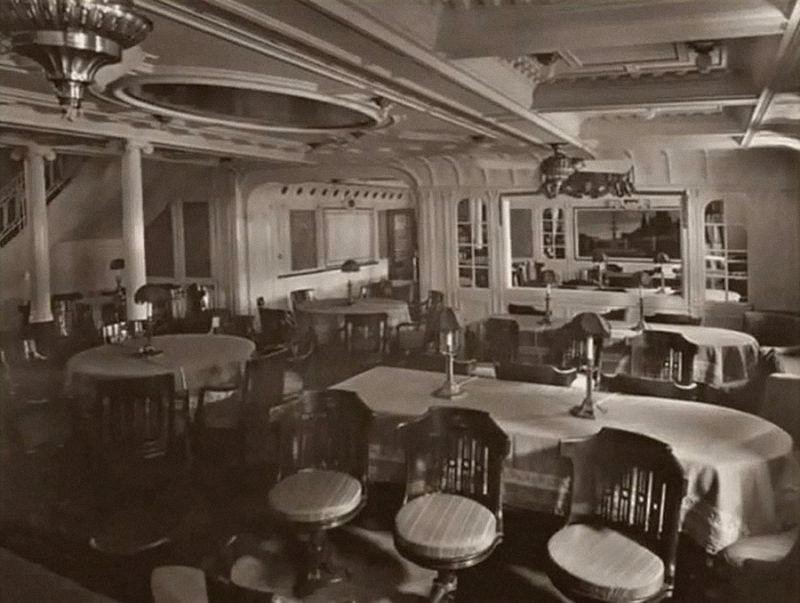 The interiors of the four Norddeutscher Lloyd-sisters were something special. For example, the Kronprinzessin Cecilie had some of her first class suites fitted with private dining rooms for the reserved passenger. Also, a fish tank was placed in the kitchen, providing first class passengers with the freshest of fish. 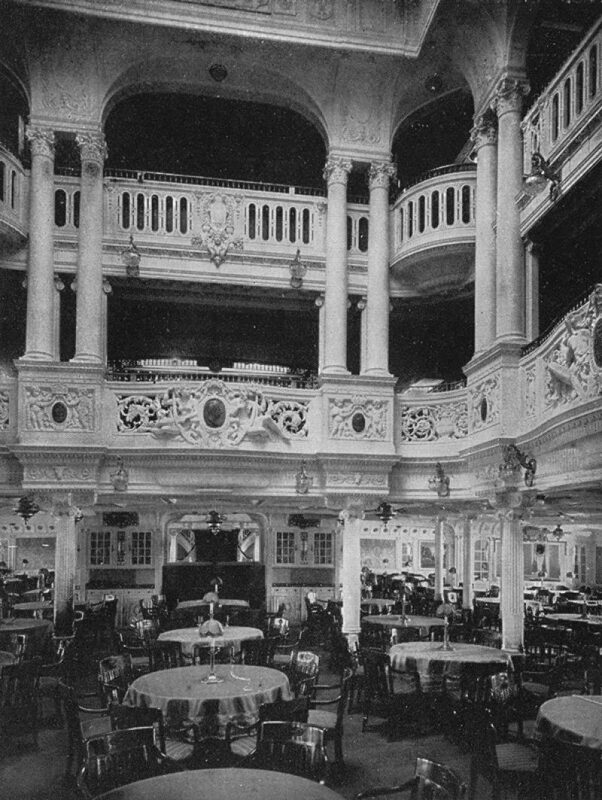 Added to this the entire ship was fitted with the best of craftsmanship Germany could offer; the salons were full of ornamented wood and gilded mirrors. The four sisters became the favourite ships for many distinguished passengers – especially American millionaires. Not only popular among the rich, the Kronprinzessin Cecilie earned popularity among the many emigrants also. Her four funnels represented safety, which was an important feature among the many European fortune-seekers. 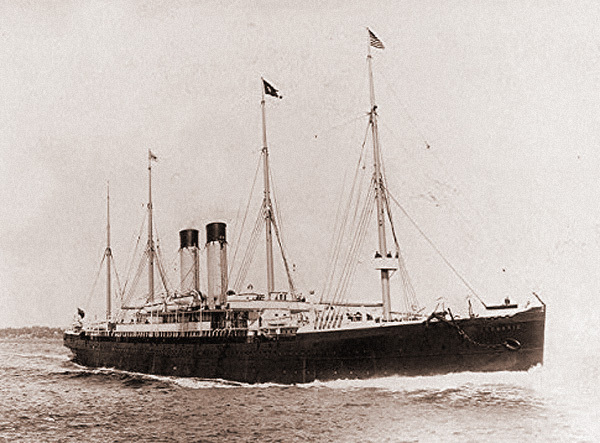 In comparison with a $2,500-first class suite ticket, the emigrant could sail on the Kronprinzessin Cecilie for a mere $25 – one hundred times cheaper. 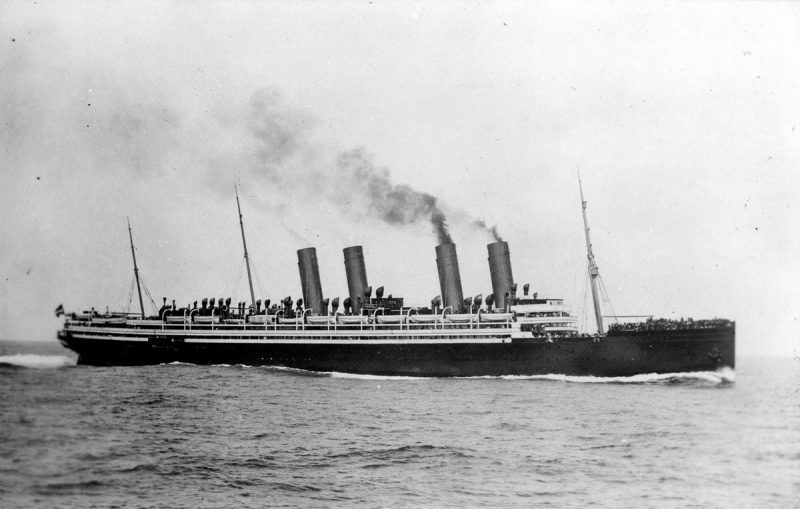 The Hamburg-Amerika Linie’s Deutschland lost the Blue Riband in 1907 to the Cunard Line’s Lusitania who managed over 25 knots as an average speed across the Atlantic. Within the year she had lost it to her sister Mauretania who would keep it for almost three decades. At 32,000 tons the Cunard sisters had totally outmatched the prime German ships. 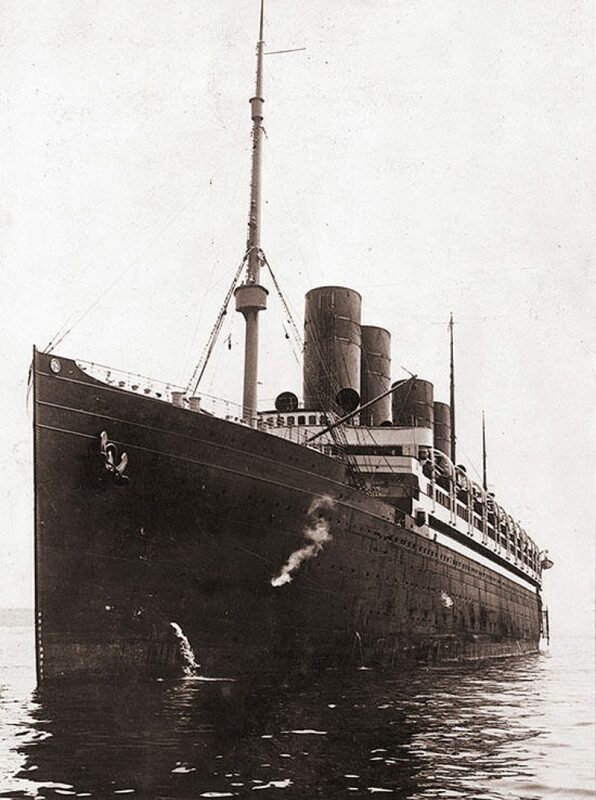 By 1911, the White Star liner Olympic at 45,000 tons carried through her maiden voyage and this marked the final surpassing of the pre-1910 German liners. The all-concerning rivalry between Britain and Germany in the old days developed into full-scale war in 1914. This required large troop-ships to transport soldiers to far away battle-scenes. Almost all of the large liners in the world were first ordered to be converted into giant armed cruisers. But having the liners patrolling almost 24 hours a day made the coal-supplies shrink rapidly. It was decided to convert the ships into troop-ships – a task they were more suited for. However, some liners remained in passenger service, which in some cases ended up in disaster. The Lusitania was sunk by a German torpedo in 1915 with a loss of 1,200 lives. The Kronprinzessin Cecilie’s fate never reached German decision. When the war broke out she was in the middle of the Atlantic heading for Germany. By accident, the ship carried a load of gold and silver at an immense value. The commanding officer, Captain Pollack, realised what danger of confiscation his ship would encounter if he was to trick his way into the Baltic Sea. In mid-ocean he decided to turn his ship back towards the still neutral United States. In order not to expose the vessel to any risks he asked for volunteers to better his all-buff funnels with a black top. 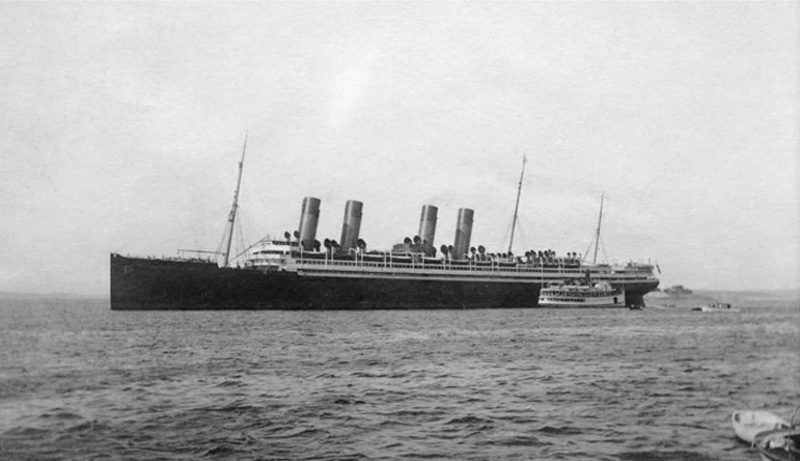 If a British ship would spot a four-stacker with buff black-topped funnels, he might mistake the Kronprinzessin Cecilie for the British White Star Line’s Olympic. Some of the passengers were furious about going back to America, and a couple of American millionaires even offered to buy the ship so she could hoist the American flag and safely enter delicate European waters. Others were pleased with participating in this ‘adventure’. The cunning Pollack reached the American coast without any problems and docked in safe Bar Harbor, Maine. If no Englishman had had the opportunity of being fooled by the Kronprinzessin Cecilie’s new colours, the residents of Bar Harbor was astonished to see ‘the Olympic’ be anchored outside the tiny port. The British knew about the Kronprinzessin Cecilie’s cargo and now wondered where she had gone. The inhabitants of Bar Harbor had telegraphed New York and asked about the Olympic. They were told that she was safely berthed at her ordinary Pier 59, and when the British authorities received the news they realised that the ‘second Olympic’ was none other than the Kronprinzessin Cecilie – now out of their reach. A week after her arrival in Bar Harbor, the ship was escorted to Boston where she and the crew were interned. 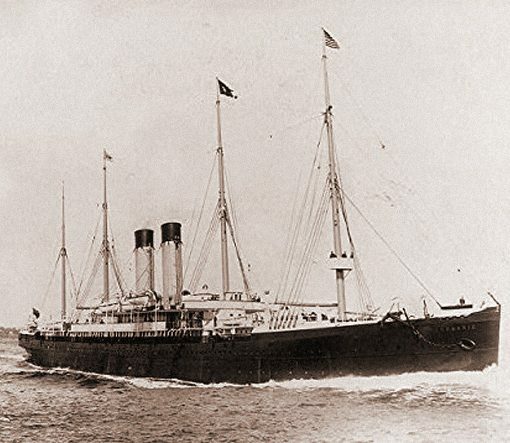 The Kronprinzessin Cecilie remained in the United States since the Germans thought it was a safe place for one of their latest merchant achievements. Unfortunately for the Germans, they were wrong. In 1917, the Americans entered the war on the British side. All German ships in American harbours were confiscated. This included the enormous 54,000-tonner Vaterland, the Kaiser Wilhelm II, the Kronprinz Wilhelm – and the Kronprinzessin Cecilie. 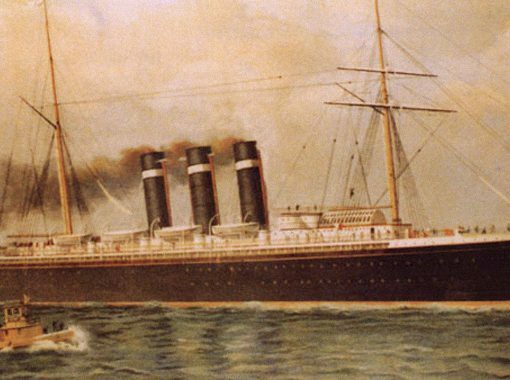 The only of the four sisters not seized by the Americans was the Kaiser Wilhelm der Grosse – she had been sunk in 1914. The Kronprinzessin Cecilie was renamed Mount Vernon for military purposes. When the Americans got hold of the ship, several war-time changes were made. The most visible was the addition of extra guns for defence, modification of the bridge and an added crow’s nest on the main mast. The entire ship was repainted in dazzle paint camouflage. The pattern had been designed by the American Everett Warner. 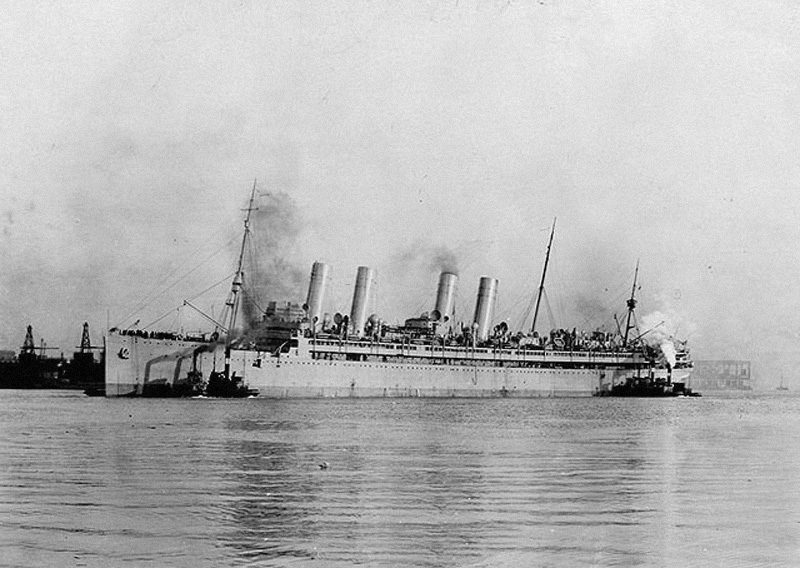 The Kronprinzessin Cecilie started to serve the Allies as a troopship, and on one occasion in September 1918, when the steamer was loaded with wounded U.S.- soldiers and returning to the Americas, not half way across the Atlantic, she was torpedoed by a German U-boat in her aft engine room. The explosion killed 37 men, but due to the vessel’s thorough safety equipment she managed to stay afloat and even steam back to Brest, France, at 15 knots! When the war finally ended later that year, the ex-Kronprinzessin Cecilie remained under American authority. She made one voyage to Vladivostok through the Panama Canal in order to evacuate refuges and soldiers. After that the ship headed for Chesapeake Bay in 1919. The ship was never taken any advantage of, and when World War II was about to become a fact in 1939, the Americans offered the former Kronprinzessin Cecilie to the British as a troop-transport, but they considered her too old. The steamer remained in Chesapeake Bay and lay there rusting until 1940, when she was finally towed away and scrapped at Baltimore.